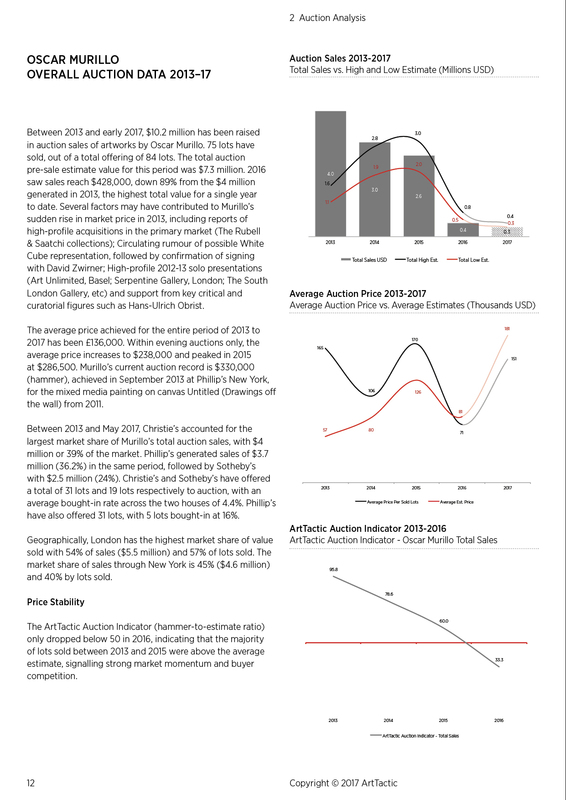 Sharp drop in auction supply triggers 82% fall in Murillo auction sales between 2015 and 2016, but market is likely to see a small recovery this year: Total auction sales of artworks by Oscar Murillo raised just under $428,000 in 2016, down 82% from 2015. 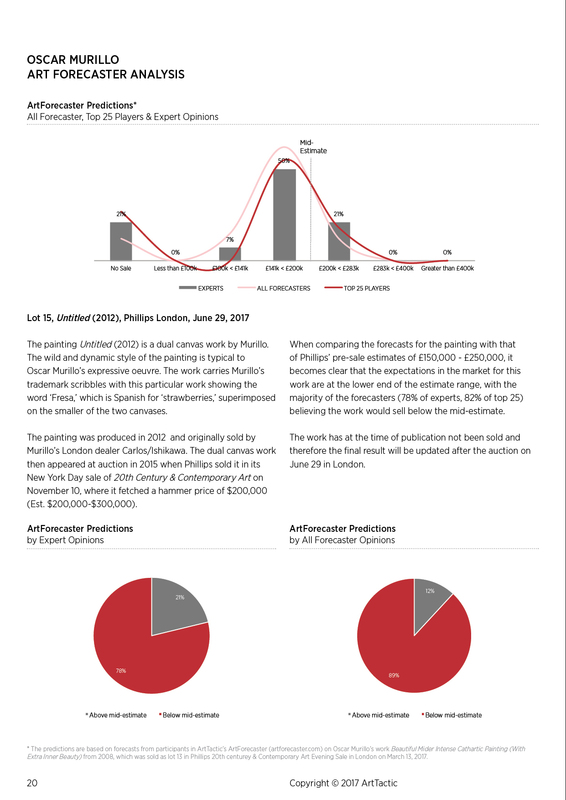 Auction sales have remained subdued in first half of 2017, although there are signs that the auction market for Oscar Murillo could end up from last year, with $160,000 sold by May 2017, compared to $428,000 for the whole of 2016. Two further lots are being offered for sale through Phillip’s upcoming 20th Century & Contemporary Art sales in late June, with a combined value of $306,480 based on the mid-estimate. 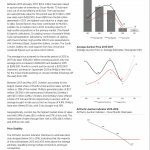 High sell-through rate for Murillo’s works since 2013: Despite a significant cooling from its 2013 peak, Murillo’s market has retained a respectable average sell-through rate of 89.3% between 2013 and 2017, with only nine unsold lots between 2013 and the present. Two of these works went unsold in 2016, and none so far in 2017. 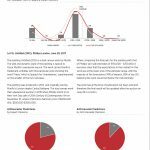 This Market Report is the first Murillo research published by ArtTactic and is to be followed by regular updates. 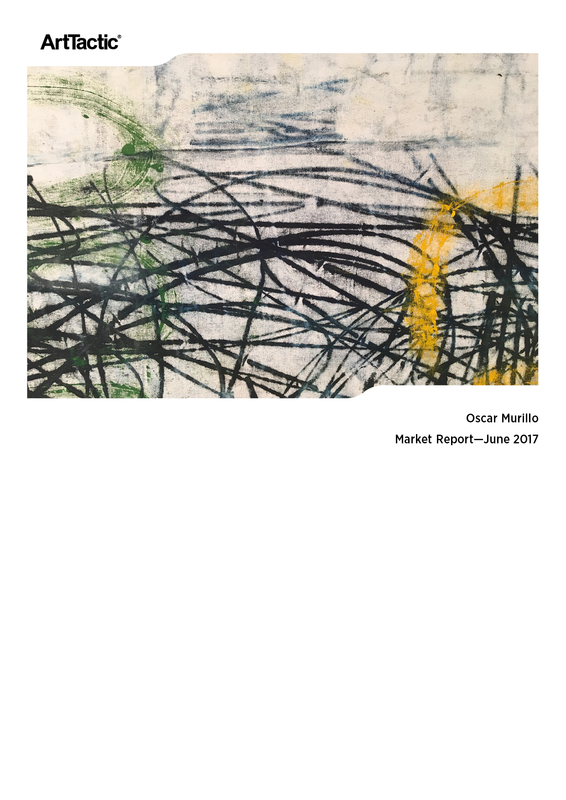 ArtTactic also offer bespoke reports on the Oscar Murillo market. For further information please contact us on info@arttactic.com. Total Sales, Average Prices and Hammer-Ratio analysis. 2013-2017. Analysis by segments including; Breakdown by Year of Creation and Auction Houses 2013-2017. Artwork Analysis by Medium 2013-2017. Price Segmentation and Top 10 Price Analyses 2013-2017.